It's been long time that I have published a post and there are a lot of topics that I wanted to publish in my blog. I have been noticing that my tech-related posts are getting a lot of response from people and hence my post for today is based on the subject "how to" - How to embed YouTube video in PowerPoint"
MS PowerPoint has been used for many presentations and there are times where it is necessary to have a video presentation along side slide shows. Example: a school presentation for parents regarding their kids learning with some sample videos. 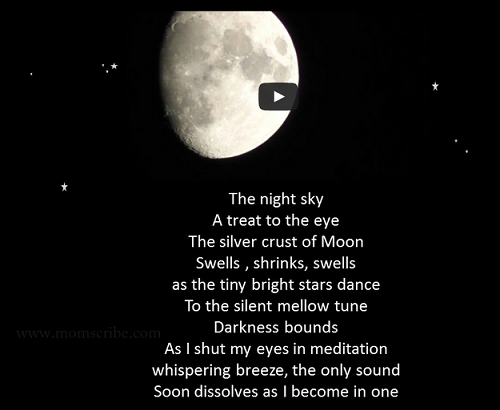 For this post, I chose my own poem about "The Night Sky" and then tried embedding a YouTube video that has a revolving Moon. 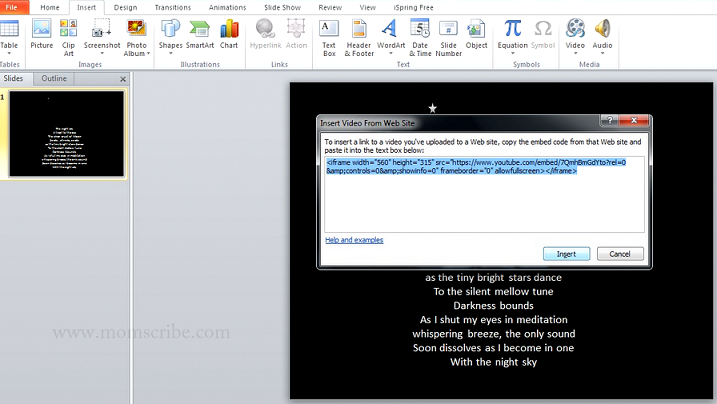 The following quick steps with images will guide you on how to embed a YouTube video to PowerPoint slides. 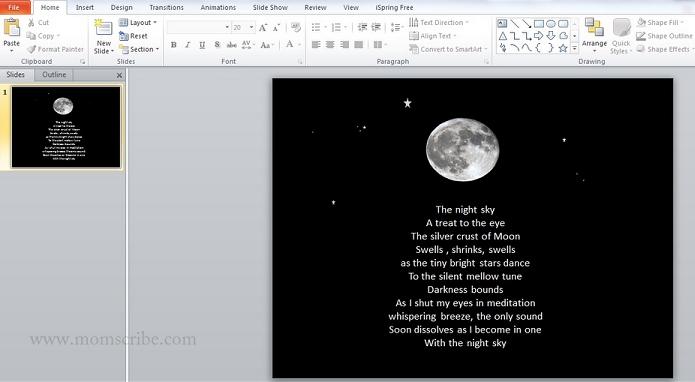 Step 1- The below is a slide that has my poem and a image from Insert -> Clip Art -> Moon. 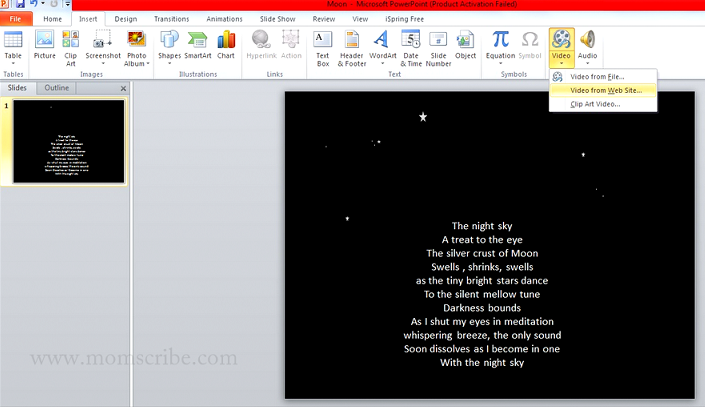 I have added few stars here and there for the night sky effect using the clip art as well. Now, to make the slide presentation more appealing, let me say that I wanted to replace the moon image with that of a video with a revolving moon. 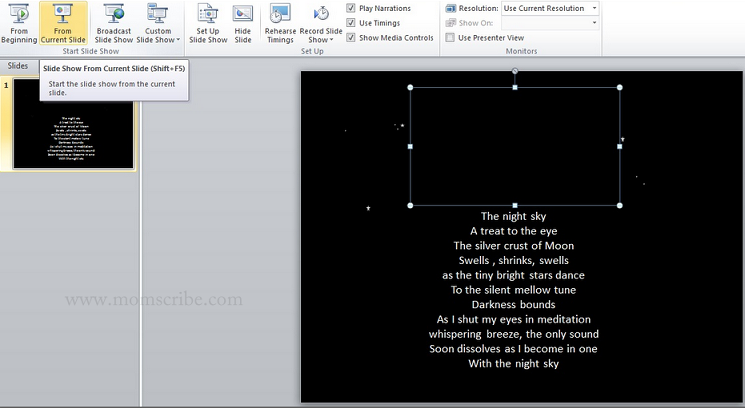 Step 2- The below is a random video selected from YouTube with a revolving moon which fits the theme of my PowerPoint slide (above). Now, to use this video I would need to click and select -> Embed -> Copy the code displayed as below ( see the yellow box). Save the copied code in a notepad (if required). Step 3- After copying the code, return again to the PowerPoint slide. Remove the moon image so that we can replace it with the moon video. Now, to embed the YouTube video go to, Insert -> Video -> click on "Video from Web Site...". Step 4: You should get a "Insert Video From Web Site" box as shown below. Now, paste the code that you have copied from the YouTube website and click Insert. Step 5: After you have clicked "Insert" you will get a box like the below. Save your project and click "Preview" if you want to or else go to Slide Show -> click "From Current Slide". Step 6 : The YouTube video that you have embedded in your PowerPoint is a success. You can click on the video to play the YouTube video. You can also make a YouTube video to play automatically by adding “&autoplay=1” to the video’s embed code. In a similar way, you can add or embed any YouTube Video in your blog or website. 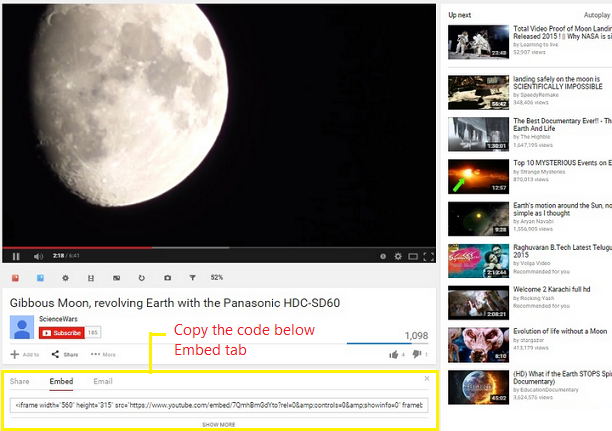 By adding an extra "&autoplay=" in the embedded code, any YouTube video can be played automatically. Hope this helps! Your blog is a boon for a greenhorn like me in matters technical relating to computers.It is instructive in detail for lay man though some are beyond me at this advanced age.I have given the blog link to my grandchildren to make full use.Thank you Umamaheswari.I wish I had your email ID to thank you by mail.